As many of you are probably aware, in August of this year, Beijing is hosting the 2008 Summer Olympics. It has certained caused a boom of construction there. When I was over in Beijing in 2005, there was a lot of new buildings, subways, highways, etc. being built to manage the hoards of atheletes, administrators and tourists that will be decending on the city. The Chinese government is going all out to present a great face to the world, which includes getting the locals ready and excited about the event as well. For taxi drivers and tourist guides, that means learning English. For the rest of the folks, that means seeing a lot of Yao Ming. Yao Ming is a very tall Chinese man, and plays basketball for the Chinese national team, and also over in the United States in the NBA for the Houston Rockets. In Beijing, I saw a ton of flat surfaces (bus shelters and building walls) covered with Yao's likeliness. Seeing Yao all over Beijing wasn't unexpected at all. 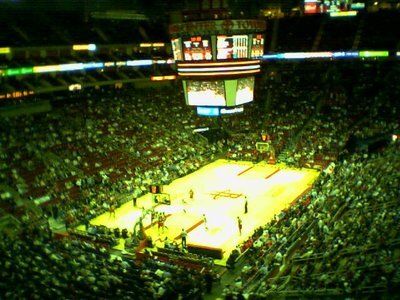 What was unexpected, though, was seeing the number of Chinese people in Houston how had travelled from somewhere (some as far away as China itself) to see Yao play. 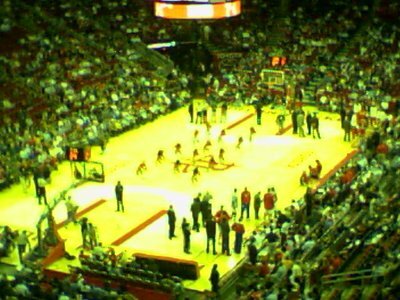 I went to a game on January 15th, when Houston played the Philadelphia 76ers. The 76ers aren't very good, so there weren't a lot of people at the game. However, of those that were there, probably 70% were Chinese. They had Chinese signs, which I couldn't read, but I'm sure said stuff like "Go Yao Go! ", "Yao, Beat the 76ers!" or "Hey ESPN China, Put Me On TV" because those are the kinds of things people write on signs at sporting events. I was pretty bored by the game, frankly. I'm not a big basketball fan, and other than a couple games I saw in St. Louis for the start of the NCAA (USA College basket) March Madness tournament, usually find myself only doing on thing at basketball games. Watching the cheerleaders! Er... I mean Dance Squad. They, like the basketball players, are professional atheletes, you know. You can't really see them very well there. I should have brought my camera along I guess, instead of counting on my cell phone to get the good picture. But trust me, the dance squad women were very pretty.